This is Cooper. He smiles all the time and has loads of energy; even knows tricks! He is owned by friends of mine. I had asked for a reference photo of him about a year ago and had not pushed myself to try a portrait of him. The challenge, here, was how to save all that white since he is such a light Golden. I hope I have captured that light, here. I approached this painting as though I was painting negative space around the lightness of his coat. The white, in this, is the white of the paper. I shaded the real light areas by using light washes of the turqouise color I used in the background. I also used the turquoise (stronger) to enhance the darks and balance the foreground and the background. I used liquid frisket to save the whiskers and eyelash areas. I scratched the tiny highlight in each eye with a razor blade. 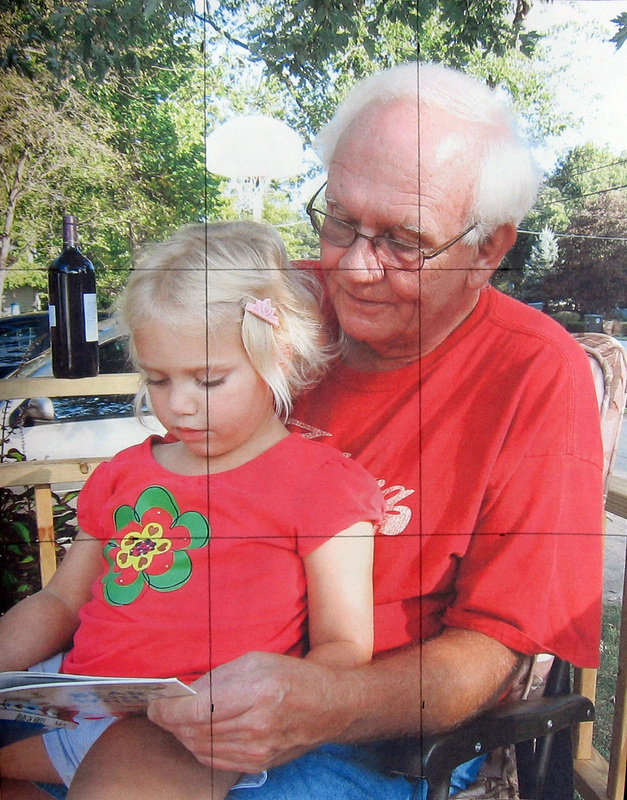 Let me say, this is not me but one of my Granddaughters with her Grandpa. I wanted to try and capture that moment when, we, as Grandparents, get to share those first moments of our Grandchildren finding out they can read. I also wanted as close to a likeness as I could get because I was going to paint family members. I’ve worked, for years, trying to achieve likenesses and find it one of the most challenging, yet rewarding and fun exercises in painting in watercolor. I do not like taking the time to make a grid or a value sketch, but did so with this particular portrait, in the hopes that it would help me achieve likenesses. I began by gridding my reference photograph into 9 equal rectangles. You can grid your photos in squares all over the page if you want, but I decided to keep it simple by dividing my photo, vertically and horizontally, in thirds. The next step was to size a piece of my watercolor paper to multiples of the same dimension as the reference I was using. I did this by setting the reference photo in one corner of the watercolor paper. 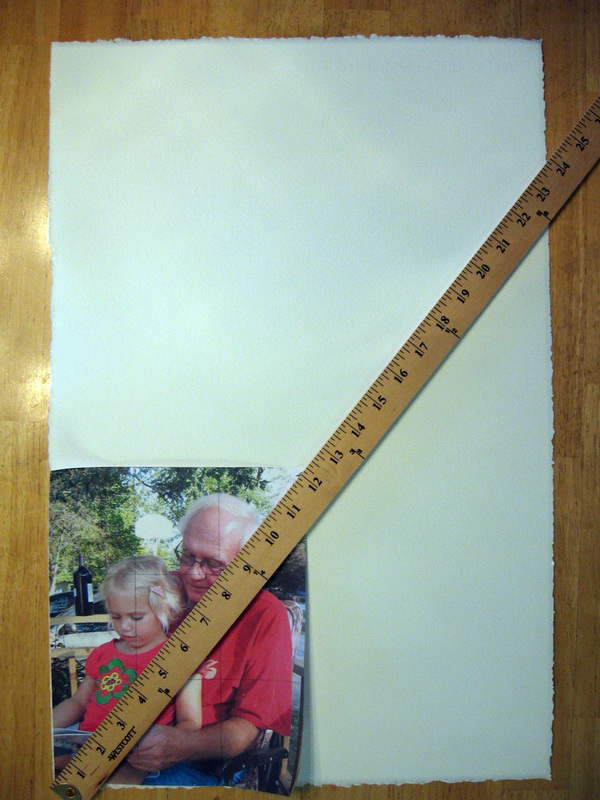 Then I placed a yardstick along the diagonal of the reference photo (corner to corner) and marked a point I wanted along the diagonal of that yardstick. Are you following me? You can make the size of your painting any size you want but in order to get the image proportionately correct, when you draw it, your format must be a multiple of the dimensions of the reference photo. Rather than do a lot of math, I choose to do this. Once you mark that point, you then draw a vertical line and horizontal line from that point to the edge of your watercolor paper and you have a multiple of the dimensions of the reference photo. 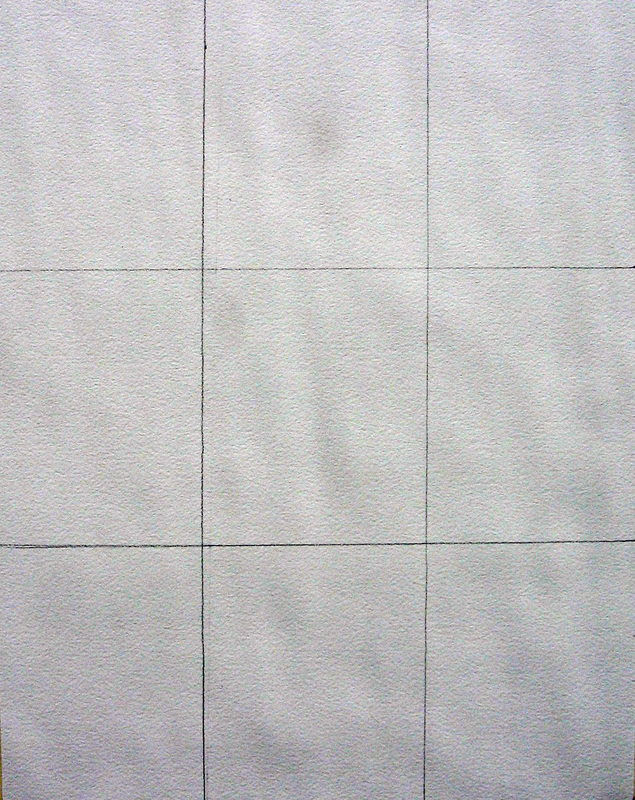 If you grid a piece of watercolor paper without the same dimensions as the reference photo, your image will end up as a distortion of the original. and drew, as best I could what I saw fall into each rectangle. 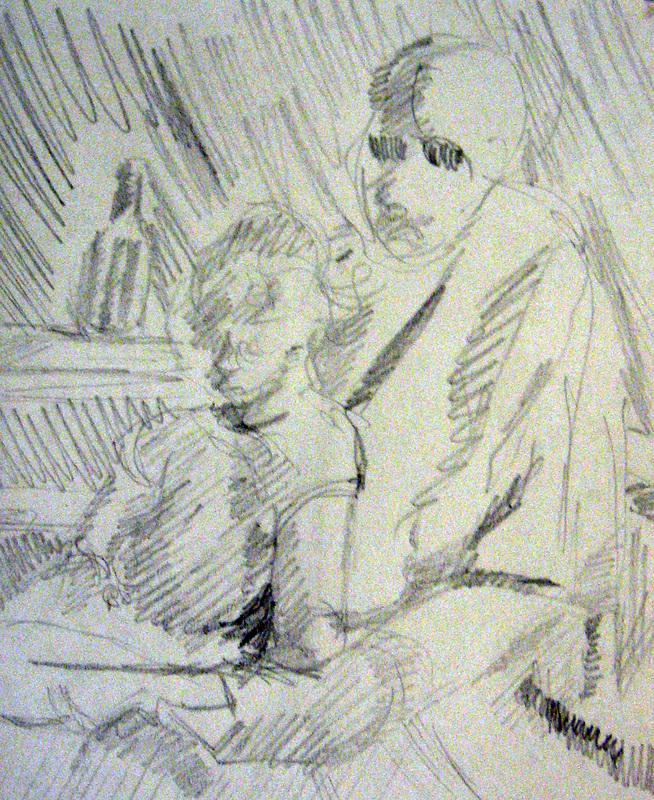 This helps with proportion, especially any foreshortening that may be present, as well as diagonals. It really helped me with getting Grandpa’s glasses correct. The above is something I rarely do, but have discovered, recently, that I am getting a little better at drawing quick value sketches. I did this because I wanted to be able to see, more dramatically, the areas that I may want to leave very light so I would get the effect of light in my finished painting. Note….my sketch is not proportionately correct nor is it detailed. I think that is what always stumped me with these before. I just said I wanted to see some essence of the light pattern I may be able to get with this. Then I began painting. Hope this helps anyone out there to try this if they are really searching for likenesses in their paintings. 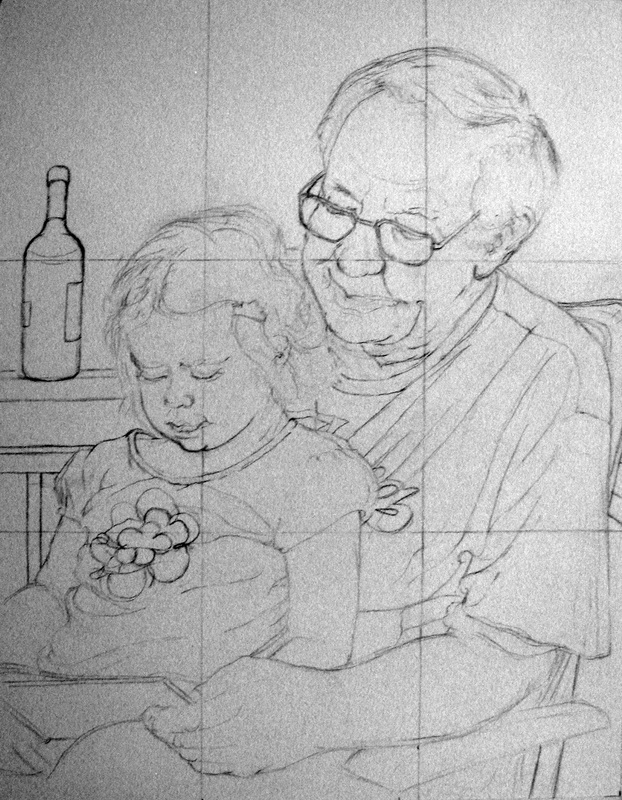 There is still a whole lot that goes into a likeness when you apply your pigment, but this is a start that may help. The above portrait is one of the most fun paintings I have done in a while. I worked mostly light to dark and wet to dry to paint the entire image. I began by doing a line drawing assisted by the use of crosshairs like I described in this post, previously. Prior to painting, erase the crosshairs. 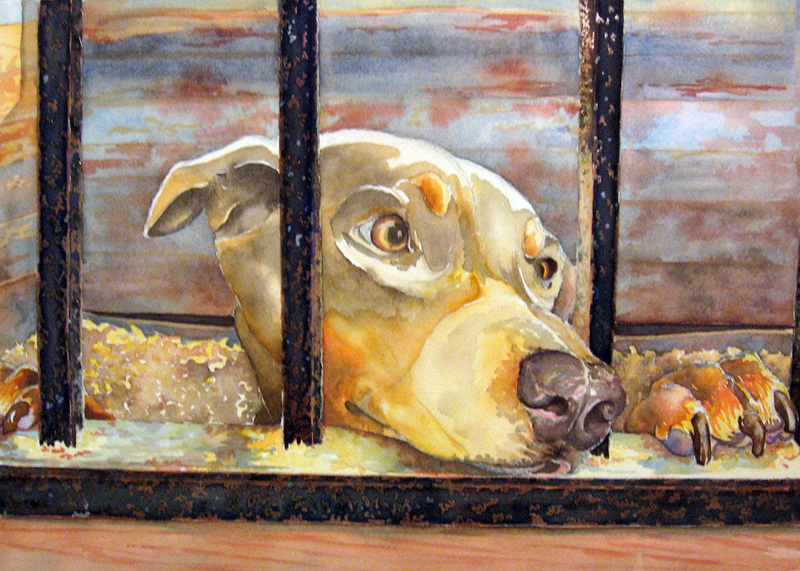 I then used liquid frisket to save the highlights in the eyes, nose, chin and on the dog’s nails. I painted the undercoat of the bars a rusty red, waited for it to dry and frisketed many areas of them so the rust marks would show in the finished painting. I painted the light colored boards on the stall to the left and then used wet-in-wet applications to define the texture of the sawdust on the stall floor. I painted the blues and reds of the stall boards wet-in- wet. I washed in some of the colors of the doberman trying to retain the light that hit the front part of his muzzle as well as defined the rounded forms of his face. I applied the first washes to his eyes. I finished the dog’s head, began the paw on the left and pads on the right paw. I spent a lot of time defining the nose. 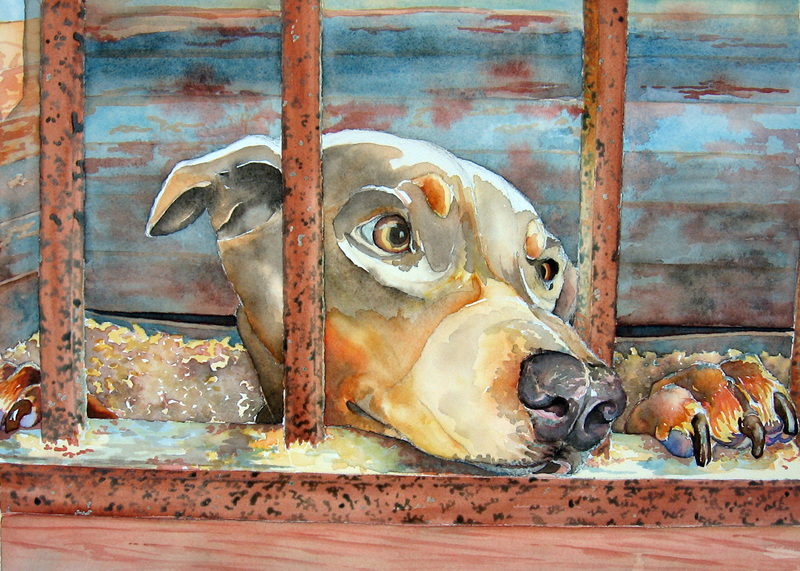 I began with wet-in-wet applications of color on the nose and finished with darker colors wet on dry. 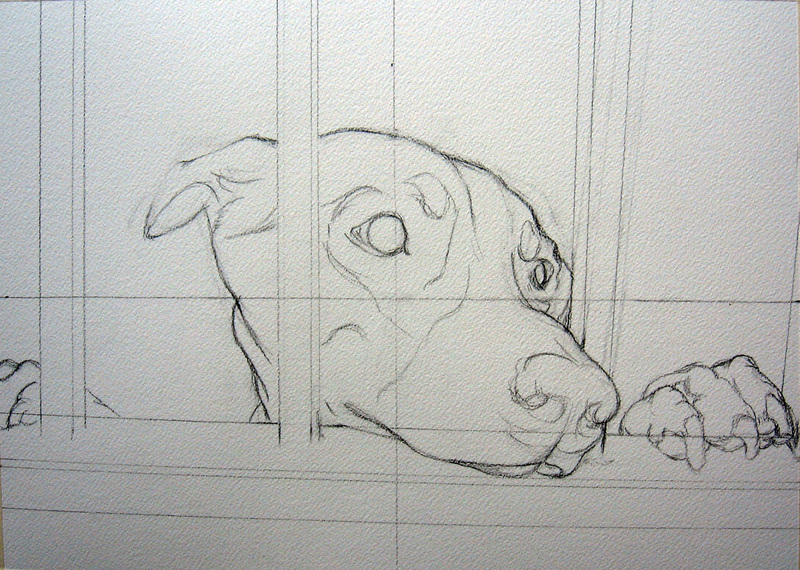 I knew I wanted the nose and paws to have more definition because they were the closest forms to the viewer. I also painted the wood grain on the bottom of the painting with the use of the edge of a flat brush and applying the pigment wet on dry. I also worked on darkening the eye and defining it furthur. 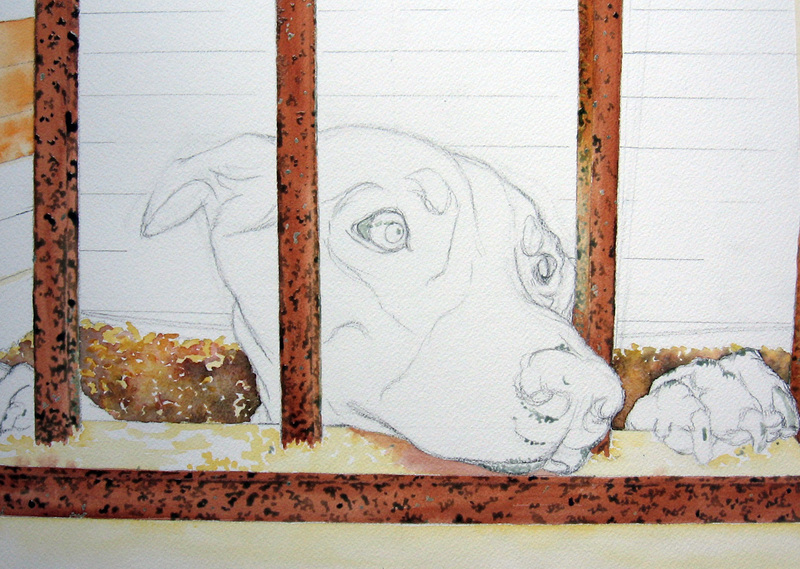 I finished the dog’s paws, painting wet-in-wet, first, and then detailing wet on dry with a tiny brush. I darkened or shadowed the background walls of the stall with a lightened wash of sepia and defined the stall ledge with blues I had used on the background. I strengthened and deepened the color of the dog’s head by scumbling more of the same oranges, yellows and browns into him. This furthur defined his forms and shape and gave him more of a 3-D look. I used a combination of prussian blue, violet and neutral tint to paint the blacks on the stall bars and waited for that to dry. I painted a thin shadow under the metal strip running across the painting at the bottom. In this step I erased all the frisket with a “rubber pick up”. The rubber pick up looks like a square eraser and can be found in most art supply stores for the purpose of lifting the frisket from watercolors. 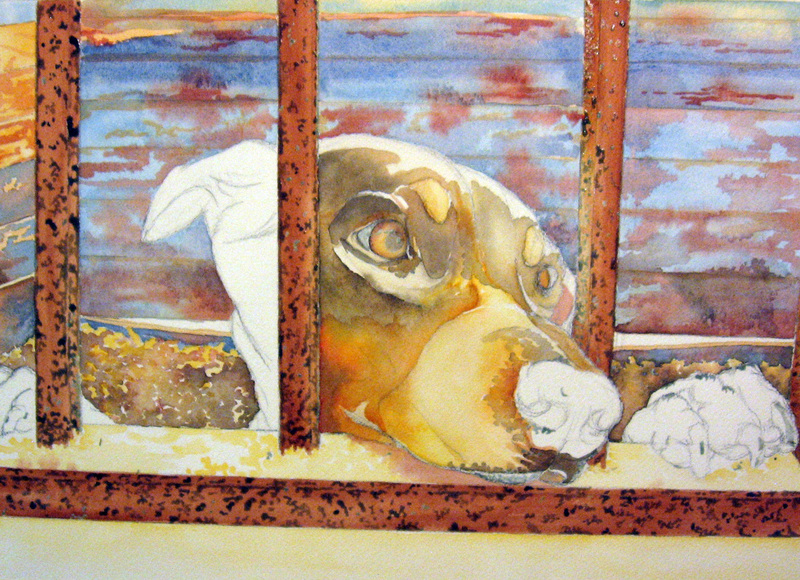 To finish the painting I got rid of the stark hard edges from the frisket on the bars by running a wet brush over them, several times, until the colors blended more and the edges softened. This drags some of the blackened colors into the lighter reds and yellows and softens that frisketed look. I then painted a shadow under the upper eyelid of the right eye on the dog and painted his whiskers in with a rigger brush. I darkened the highlight on the bar to the right of the dog’s head with some copper kettle and raw sienna. 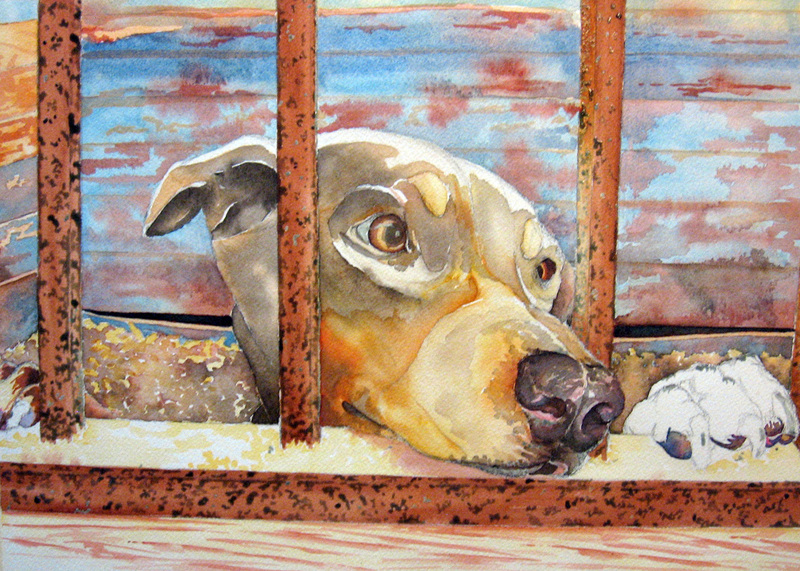 I added some soft blue to the underside of the dog’s eye to soften the prominent highlight there on his face. I touched up the detailing on the nose and his nails, darkened his chin and called it finished. 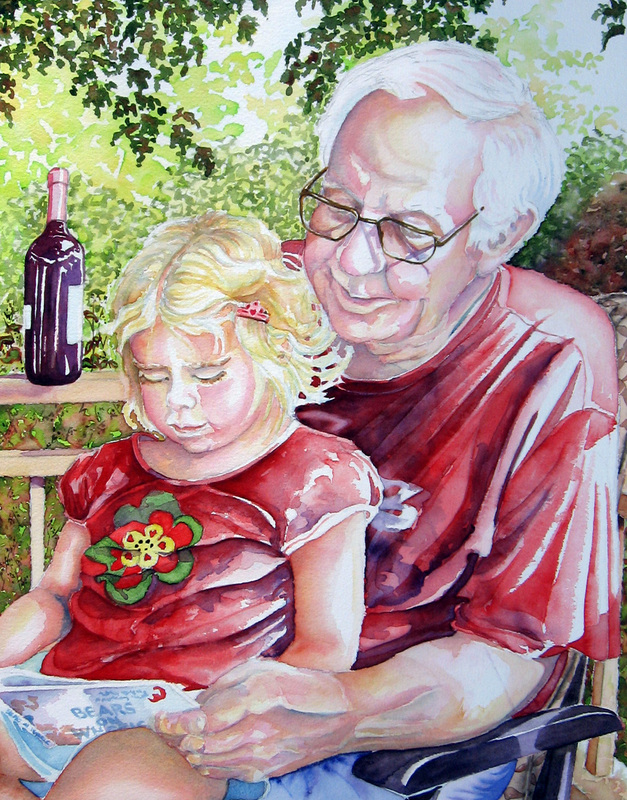 I thank Caron Steinmetz from Paint My Photo for the photo reference for this painting. Carol King asked a very good question in the comment section about what kind of frisket I use and how I apply it. Above is a photo of the supplies I often use. Left to right is a natural rubber pick up, Incredible White Mask, Pebeo Drawing Gum, jar of brush cleaning soap and a 2/0 liner brush. I dampen the surface of the brush cleaning soap by spritzing it a couple of times with my squirt bottle. I wet my liner brush in the water glass and then swish it in the brush cleaner a couple times (I do not coat it thickly with the soap). Coating the hairs of the brush with a gentle soap helps to keep the frisket from sticking to the hairs of the brush and damaging them. I then dip my brush in the frisket (my frisket of choice is the Pebeo Drawing Gum because it is the thinnest and the easiest I have found to work with and does not clump as quickly on the end of my brush). A close second to this frisket is the Incredible White Mask (I have also used it effectively). I then quickly paint the frisket in the areas of the painting I want to save either the white on or, in this case, the red areas of those black bars you see in the above painting. This also requires that I rinse and repeat the soaping and frisket dipping as often as needed to prevent the end of my brush getting clumped up with dried rubbery clumps of frisket. When you work with it, you will know what I mean by that. The frisket, in small amounts, on your brush, can dry rather quickly, so you constantly have to stay ahead of that occurring. Sometimes I have to stop and strip dried frisket off the end of the brush with my fingers. If you are allergic to latex, use gloves when touching this substance. The friskets I pictured, here, have latex in them. 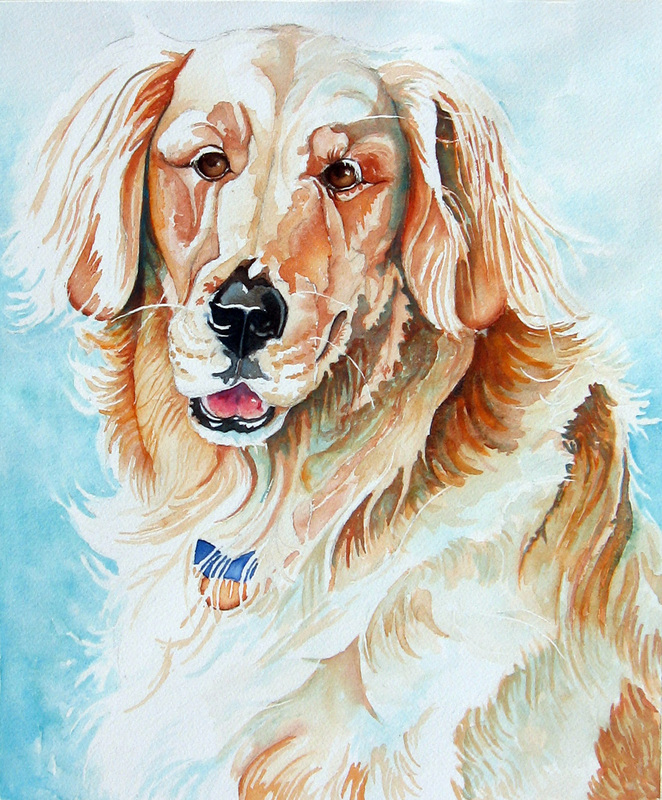 Depending on the amount of frisket you use, it takes anywhere from five to fifteen minutes to dry before you can continue painting in order to prevent smeering it. I have also used frisket to splatter a painting. It is very effective for rendering falling snow. In that case, I use a little larger round brush. Warning! It is not effective to use liquid frisket on large areas as it will often tear the paper. The frisket tends to shrink as it dries those and you can damage the surface when you remove it. I just save the whites of larger areas by painting around them and softening the hard edges with a damp brush. If you really need to save a large white area by masking, it is advisible to use masking paper found in most art supply stores. Always recap your bottle of frisket immediately following use or it will dry up in the bottle. Hope this helps you get started on trying the frisket in your paintings.